The stent dilates the stenotic portion of a blood vessel and it supports that region so that the vessel can heal. Once it heals and vascular patency is maintained, the stent disappears, leaving no foreign materials in the body. The Igaki-Tamai Stent is a biodegradable coronary stent. The stent is named after the late Dr. Hideo Tamai, who originally helped to develop the stent, and Dr. Keiji Igaki, who oversaw development of the stent here at KYOTO MEDICAL PLANNING. In a clinical study in 1998, the stent became the first biodegradable stent to be placed in human coronary arteries. Results of that study verified that the stent is effective and safe. In 2007, a biodegradable peripheral stent based on the Igaki-Tamai Stent became commercially available. The new stent, the Remedy™ stent, has been approved for use in the treatment of blood vessels in the lower extremities. Implanting the Igaki-Tamai Stent carries considerable risk since this medical device is placed in the coronary arteries. KYOTO MEDICAL PLANNING will continue to develop new stents so that we can offer safe, quality products. 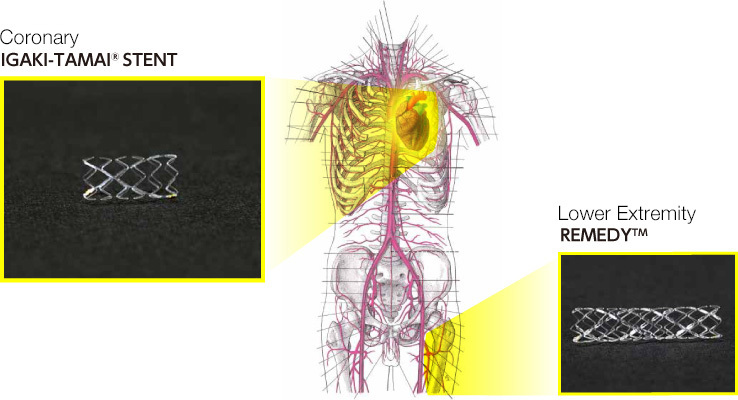 Have a look at the Remedy™ stent here.